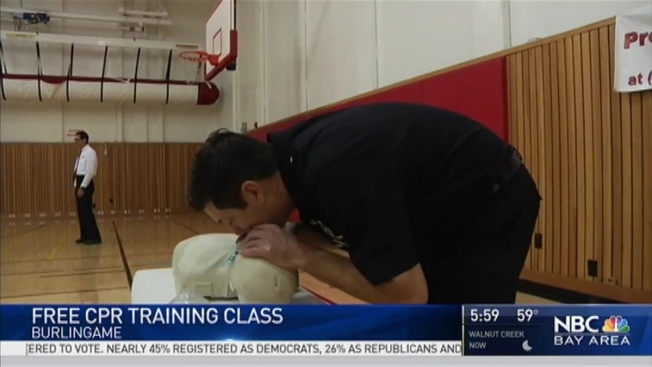 More than 250 people ventured to Burlingame High School Sunday to learn a potentially life-saving skill for free. Thanks to various local fire departments, community members were taught how to perform CPR and use an AED, or automatic external defibrillator, to help restart an ailing person's heart in the event of emergency cardiac arrest. The mass education event was spurred into being after Burlingame resident Jim Sobel suffered a heart attack, but was saved by his 14-year-old daughter who didn't hesitate to act when her father started coughing violently, became unresponsive and passed out. "Within a few seconds, I just kind of knew what to do and I did chest compressions," Tovia Sobel said. The tale of the teenager's quick-thinking spread like wildfire around the neighborhood. "Tovia is hailed as a hero really for jumping in within a minute doing chest compressions and the doctor said that's really what saved his life," Andrea Sobel, Tovia's mother, said. The Sobel family is now committed to spreading the word about the power behind pumping on someone's chest. "We know firsthand that CPR saves lives and we just feel so passionate about spreading the word and getting others to learn CPR so that they can also help save lives," Andrea said. Roughly 735,000 Americans are stricken with a heart attack each year, according to the Centers for Disease Control and Prevention.